Below: Back door, back yard of the hostel. 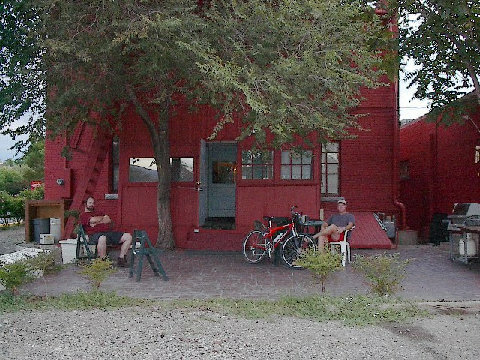 The writers of the "Hostels USA" guidebook have always been very accurate when describing a hostel. I've always been amazed how accurate even their most detailed descriptions were of the many hostels that I've visited. However, their description of this hostel is an exception. Maybe it changed owners or something. One reason I chose this hostel was because it was supposed to be well managed, and "under control". Well, that was not the case. I won't bother complaining too much. I'll just say that this is the only hostel where I've ever had anything stolen. I momentarily left my duffle bag in the back hallway. When I came back, it was gone. One of the "residents" (not a hosteller, but one of the locals who appeared to be living there temporarily), told me that my duffle bag was probably stolen by a homeless person--he said that often happens. Another thing that bothered me about the place was that about 9 pm the manager signed in a gentleman who was not a hosteller, and who was obviously drunk. Then she locked the office door and told me she was going home for the night! Well, that was a first in my hostelling experience! This hostel had the worst security of any that I'd ever encountered. I would have packed up and left--but it was late. That's another good reason why one should stop traveling earlier in the afternoon--so you can check a place out before it's too late and you end up having no alternative choices. Above: Standing--the manager, the only time she smiled. I thought the guy at the computer worked there, but apparently he was one of the resident guests. Left; The hostel itself was gorgeous! 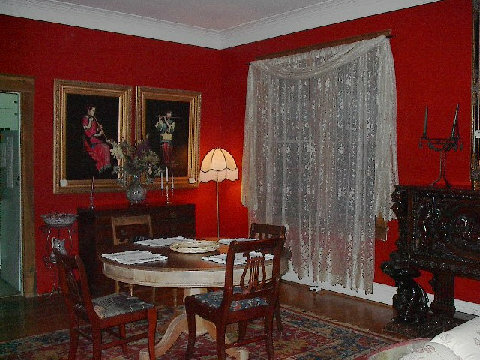 Rich red wall paper, original woodwork, ceiling fans, Asian rugs, beautiful furnature. 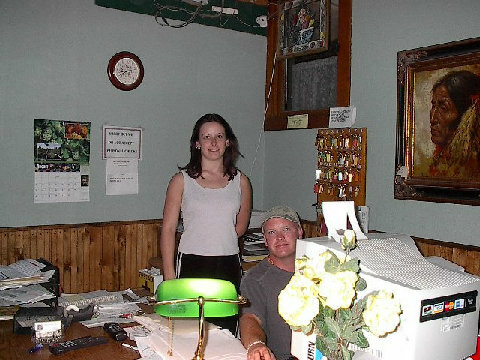 The Hostels USA Guidebook comments, "...the owners of the hostel are antique collectors, and their aptitude for it shines through in each of the individually decorated bedrooms..."
You could tell that the place had been well maintained in the past. It just didn't make sense that such a beautiful hostel would be so poorly managed. 5 AM Back on the road. I-70 to Rt. 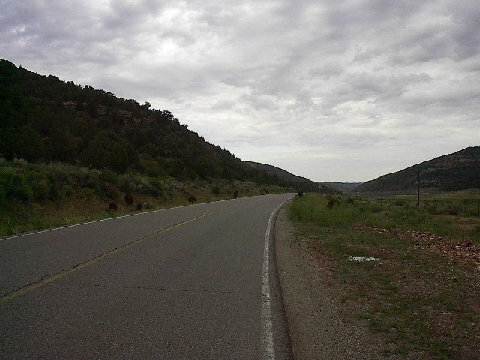 139 north to Rangely, CO. Then Rt. 64 to Dinosaur. CO, and US-40 toward Salt Lake City, UT. When I arrived at the Hotel Melrose Hostel, I couldn't get in. I knocked on the doors, knocked on the windows. No one answered. I drove to a restaurant and used their phone to call the hostel. No answer. It was getting late, and I didn't want to have to find someplace else to stay, so I went back and tried again. Again, no answer. Finally, a hosteller came by with a key and opened the door. The manager was nowhere to be found--until later. 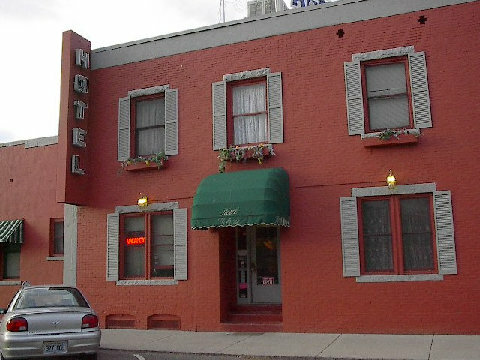 Today, February 7, 2007 Terry Ballard signed my guest book and informed me that as of 3/15/06, the Hotel Melrose has new owners and new management. Their web page remains the same, so you can click on it and check out the new Hotel Melrose House for yourself. 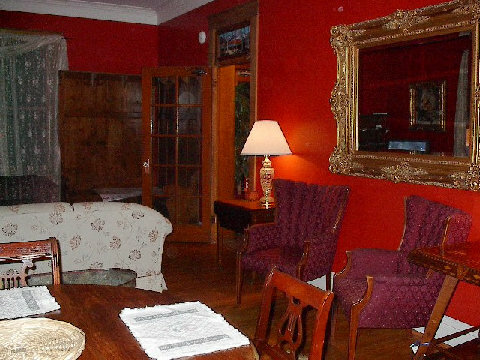 And please keep in mind that the negative comments that I made on my web page reflect the experience that I had at the Melrose House way back in 2000. Now that it has new owners & managers, I'm sure the problems that it had back then have been rectified. Someday I hope to go back and check it out myself--it is such a beautiful place!